Analog tools is a company based in Paris, France that provides services and solutions to musicians who are looking for simple yet highly functionnal guitar and bass systems.Though we specialize in custom pedalboards and rack systems builds, we also offer to our clients numerous products that they can use in their own systems builds, such as true bypass mechanical loopers, true bypass relay-based programmable switchers, patch cables, instrument cables, midi cables, etc.Our unique effects pedals rental service aims at providing session and touring musicians, producers and recording studios with turn-key pedalboard systems loaded with top quality current and past production boutique pedals. 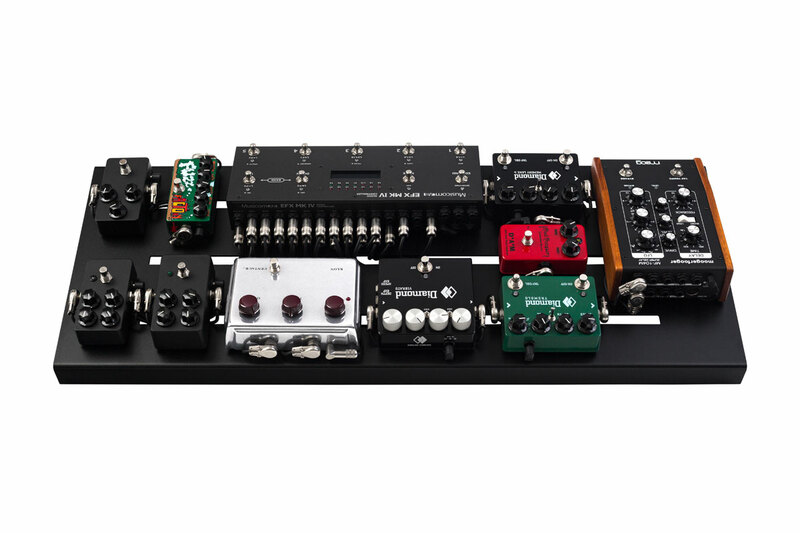 These complete pedalboard systems can be used by themselves or in conjunction with the clients' own system in so to offer an additionnal layer of tonal possibilities, whether it is for a recording session, a local gig or for a multi-date tour. Wet/Dry system built around 10 pedals and a MusicomLab MKIV audio controller. Powered by 2 Cioks DC8. 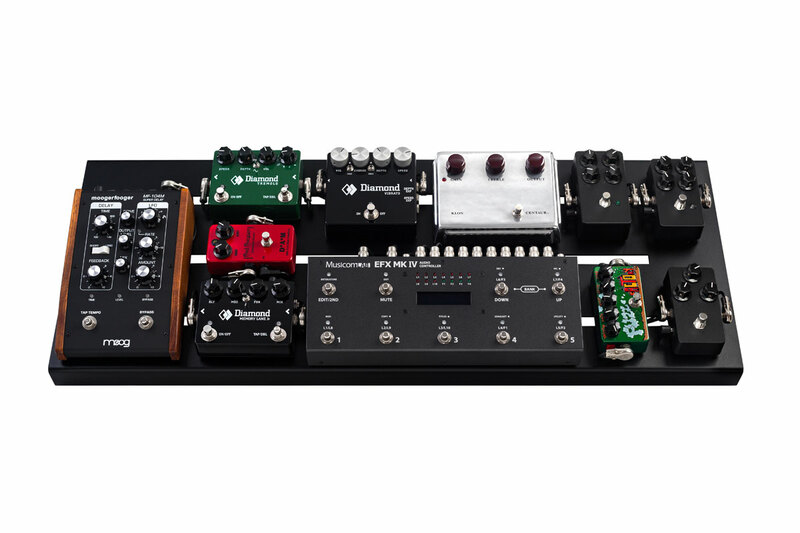 Germanium Fuzz – ZVex Fuzz Factory – Paul C. Timmy – Fullone Sixty Nine – D*A*M Treble Booster – Silver Klon Centaur – Buffer – ISO box to Dry Amp – Diamond Vibrato – Diamond Tremolo – Diamond Memory Lane JR – Moog MF104M-SD – to Wet Amp. The aluminum board measures 91cm x 33cm x 12cm and fits perfectly inside a Pelicase 1700. 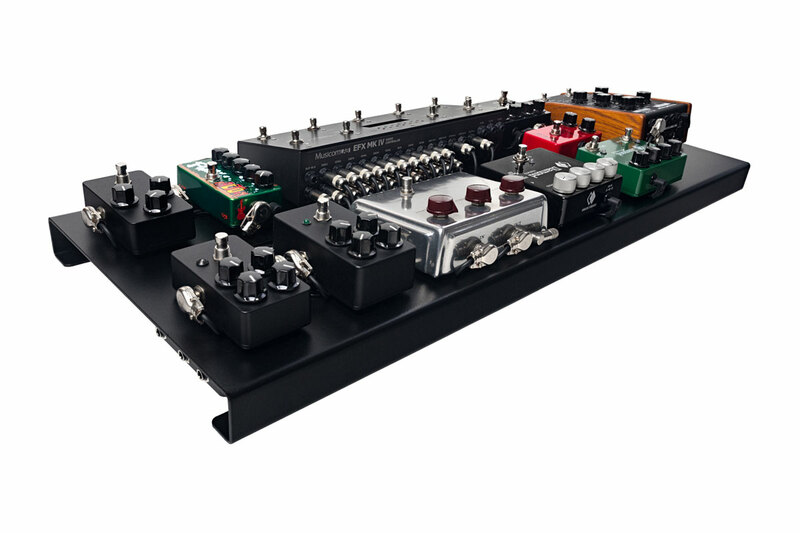 Secondary audio and power components [in/out junction box, buffer, ISO box, power supplies, AC power junction box] are mounted underneath the board, leaving accessible to the user only the main components [pedals and audio controller]. A more compact build can be achieved this way.